Whenever a baffling crime foxes Scotland Yard, the Consulting Monkey dons his deerstalker, takes up his trusty magnifying glass, and employs his famous dictum "When you've eliminated the improbable, anything left over is the truth, no matter how stupid it seems to be". 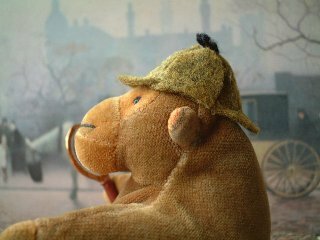 Mr Monkey's deerstalker is made of felt with a little bit of thick thread. The lens of his magnifying glass came from a Kinder Surprise toy, with a self-adhesive copper foil frame and a dowel handle.